The Workers’ Bowl on November 3 will take place at a critical time, when Ontario workers are uncertain what our labour rights will look like next year. Leading up to this 7th annual fundraiser of the Ontario Employment Education and Research Centre (OEERC), workers have been relentless in spreading the word about the new rights we’ve won this past year and the $15 minimum wage still set for January 1. Just last week, over 50 actions were held across the province for the October 15 Day of Action! Hundreds of workers put their all into letting our communities know what rights we have at work. This type of creative, effective community outreach does not just happen on days of action! It’s happening every week, and being driven by dedicated leaders like Nadira. Nadira has lived in Regent Park since coming to Canada from Bangladesh. She has been a real force within her community, doing grassroots public health outreach with groups like the Regent Park Community Health Centre, Access Alliance Health Centre as well as various community food centres. After joining the movement for decent work, Nadira completed the Feet on the Ground organizer training, funded by the OEERC. Now her outreach and leadership skills are even sharper and focused on making sure workers know their rights. Nadira fearlessly knocks on doors and stands on street corners to share her knowledge not only with her own Bangladeshi community, but with all immigrant and racialized workers in Regent Park. Her energy and commitment to speaking out about fairness at work has encouraged other workers to learn about their rights and also pass it on. Besides talking directly with workers, Nadira is also great at approaching different community groups and making allies. 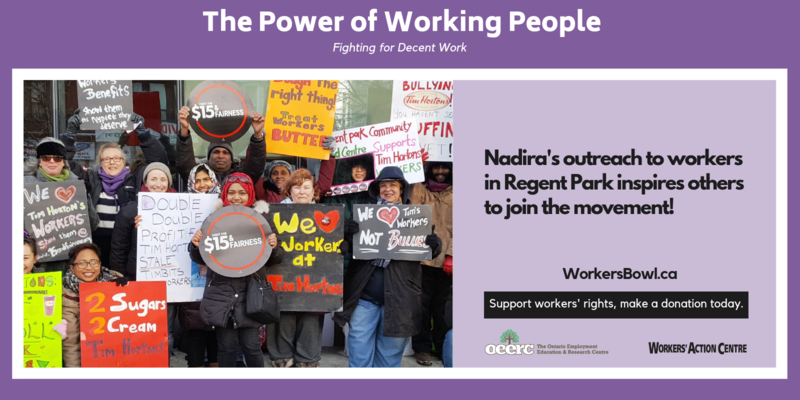 As a result of these carefully built relationships in Regent Park, Nadira has been able to passionately deliver many workers’ rights workshops at various community agencies. The powerful effect of Nadira’s outreach continues to radiate through Regent Park and beyond! The steady stream of impactful outreach by leaders like Nadira keeps inspiring more workers to develop their own leadership skills. You can support our leadership development programs, and the thousands of workers that benefit from them, by donating to the Workers’ Bowl today. (Tax receipts are available for donations of $10.00 or more.) Another simple way to help out is to share this story with your networks. Also, don’t hesitate to contact info@workersactioncentre.org to host a Know Your Rights workshop in your community.